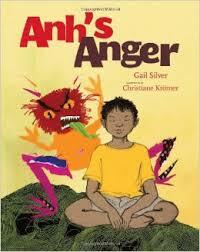 Ahn’s Anger gave a face to the emotion that humans have the most difficulty understanding and properly channeling. Watching my three children grow and evolve, I have worked to each one, in their own way, how to recognize their anger, and not act on it or channel it in a destructive manner. This book addresses well this emotion and opens space for this conversation to take place with even the youngest of children. In the spirit of the book about anger, I would like to share with you another way to help your child shed this uncomfortable emotion. As pagans, most of us have studied that power within the Elements. We are familiar with the cleansing power of fire. A ritual that I like to do with my children when they are nagged uncomfortably by this powerful emotion is a Ritual Burning. Always begin by setting up Sacred Space, whatever that may look like for you and yours. First, ask them to write down or draw the source of their anger on a small sheet of paper. Ask them to really channel that energy through their writing implement of choice, and lay that vision upon the paper. Talk to them about the picture or words they have written. Even the act of writing can help them to release those feelings. Next, explain fire safety, perhaps comparing it to anger and how those feelings can get out of control, just like fire, and consume dangerously. After you have told them how to properly conduct themselves around fire, making sure they know only to do this under adult supervision, light a small candle or charcoal in a cauldron or other safe receptacle. Inform those participating that they can choose to hold onto the anger, or they can choose to burn it up and release it. Let them decide, but do not judge their decision. Once complete, snuff out the fire and close the Sacred Space, or let it dissipate as you see fit.